I see all these aftermarket hoods on the maket now with vents and intake piping, even the GT500 has vents don't have gutters at all. Where does the water go?? I know the shaker hoods have some kid of gutter system, but like the KR hood they use on K.I.T.T. for example, you are running hot and a heavy rain sets in, cool water crashing on a hot engine sure would seem healthy to me. Which brings me to the question of, where CAN'T water hit on an engine? i mean hell if it can rain on my motor i can probably use a hose to clean it, but there has to be limits, no? The only spot you don't want water pooling is in the coil packs. They become hot and crack, which causes misfires. I wash my engine and bay regularly, but I use high pressure air to blow out the water after, and have no issues. In order to get water ingestion frm the hoods, you would need a firehose spraying in constantly. See but for example, the hood below pulls air right to the intake, but i would imagine while raining, water would flow pretty easily in there while driving, which would pretty much cause it to dump right on the intake. Just an observation. 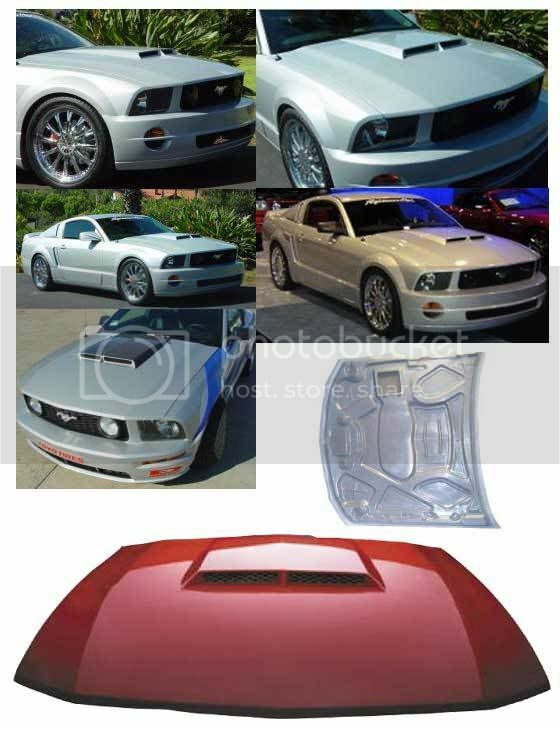 Credits: This image was taken from mrbodykit.com i have used it without permission but am using it in the interest for purchasing this hood, and in no way trying to use it for profit. Just be careful not to drench the engine. Ive driven in wicked rain before but I make sure I dont park it under the rain. And I avoid running water on the vents into the engine when washing. I wonder how much of a possibility it would be to make some kind of detachable inner cover for the vents. The intake would pull from the normal place when the scoop is blocked off. I think the real task would be actually making it look good when the hood is popped . Maybe plexiglass or something. All i know is i have to ditch the stock hood on this one. That goofy bolt on scoop it came with is making my stomache churn. The way mine are is they have drain vents on the bottom. But I have a heat extractor not a ram air. I would think though even in heavy rain the water would be mist by then. I have an almost identical hood and have zero problems with water. I only drive on nice days so hopefully the rain will not be a problem...My hood did come with removable trays for the top vents.